Happy Windsday, friends! 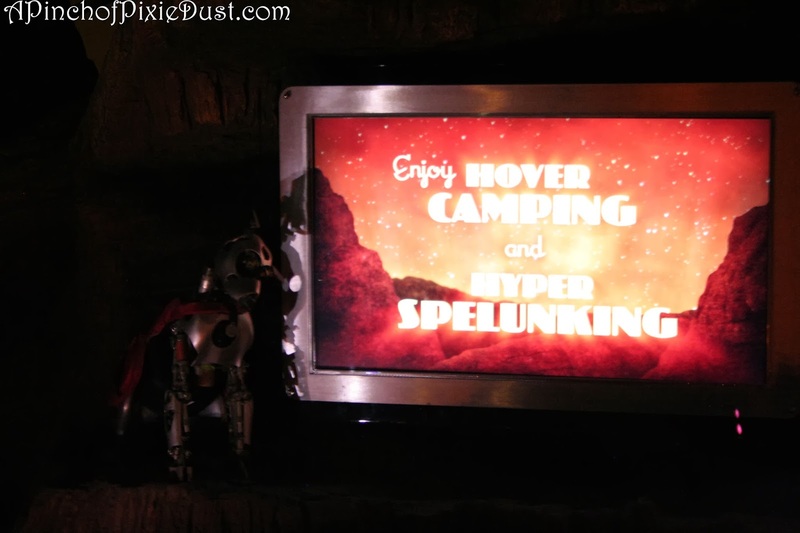 Do you know Where in WDW to find this sign for Hover Camping and Hyper Spelunking? Spelunking, apart from being one of the coolest words ever, means cave exploring. Last week's trivia photo, as you all guessed, can be found in the line for Rock n' Roller Coaster, just as you enter the G Force Records Studios! Space Mountain arriving spaceflights debarkation area, scenes seen from a moving sidewalk. Since I haven't done Space Mountain in AGES, is this the part of the scene that can be seen on the TTA when you look down if sitting on the left side? If so, that's so cool because hubs and I have never gotten a clear look at it since we ONLY see it from the TTA!